A couple of weeks ago we arranged to meet up with our friend Wes for lunch, and when I realised he worked near Queensberry street in North Melbourne, my first thought was: "OMIGOD LET'S GO TO BEATRIX!" I've been seeing a lot of buzz about Beatrix Bakes on Twitter, and I was super-excited at the prospect of trying out their cakes. Unfortunately when we got there around 12:30 on a Wednesday, they were full - I didn't realise the space was so tiny - and it didn't look like anyone was about to leave. The cakes looked awesome, and I was gutted to be missing out, as I'd already decided I wanted a piece of their red velvet cake with white chocolate and cream cheese icing as soon as I'd walked in. Oh well! I'll have to make sure I pop down at a quieter time! 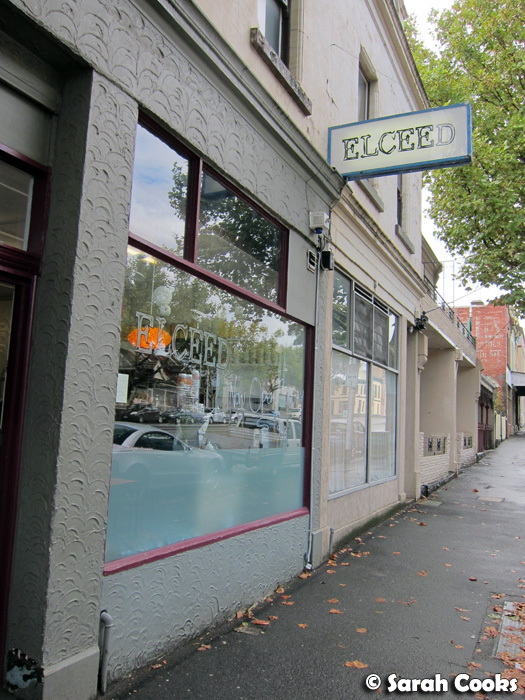 A quick drive up the road, and we stumbled across Elceed. It looked pretty good from the outside, and most importantly there was a free park out the front - success! It was a rainy, cold day, and as soon as we walked in we were hit with the comforting aroma of something gorgeously garlicky roasting in the oven - perhaps mushrooms? 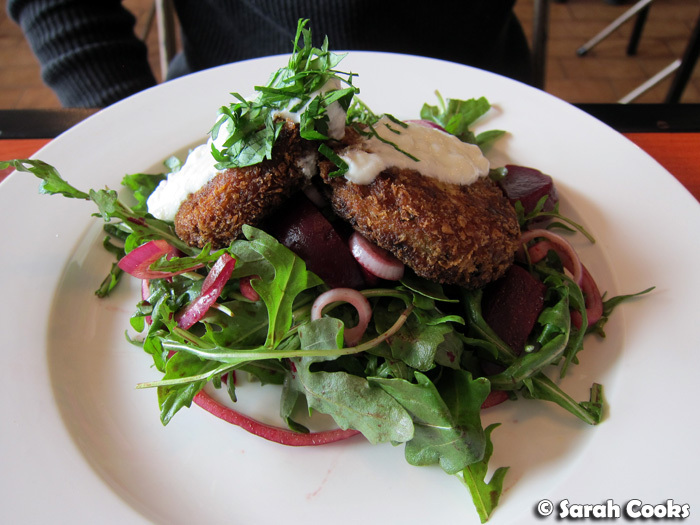 It was very homey, and it reminded me of being in my own kitchen when I'm busy cooking. 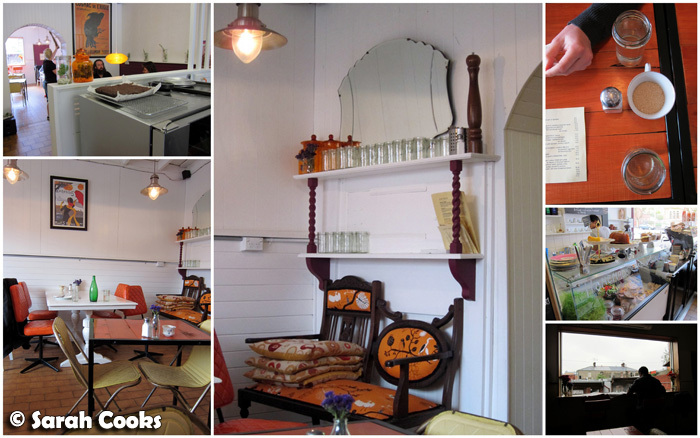 I also loved the cosy, retro decor - sometimes it's nice to visit a cafe that doesn't look like a warehouse, doncha think? Hehehe. 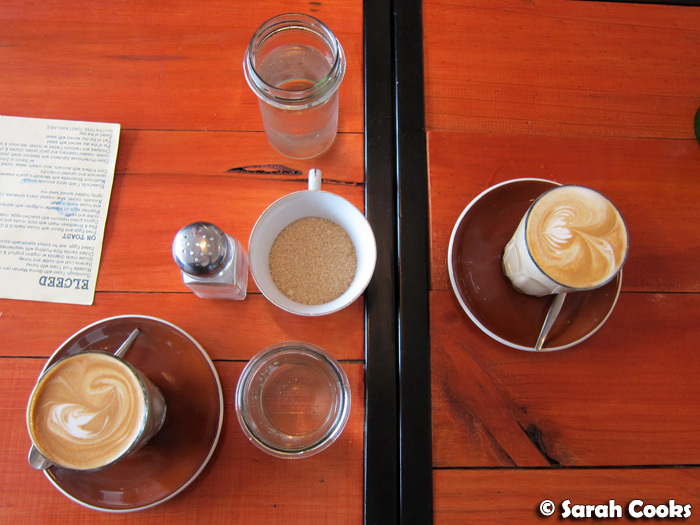 We started with a couple of lattes, both creamy and full bodied. Love! 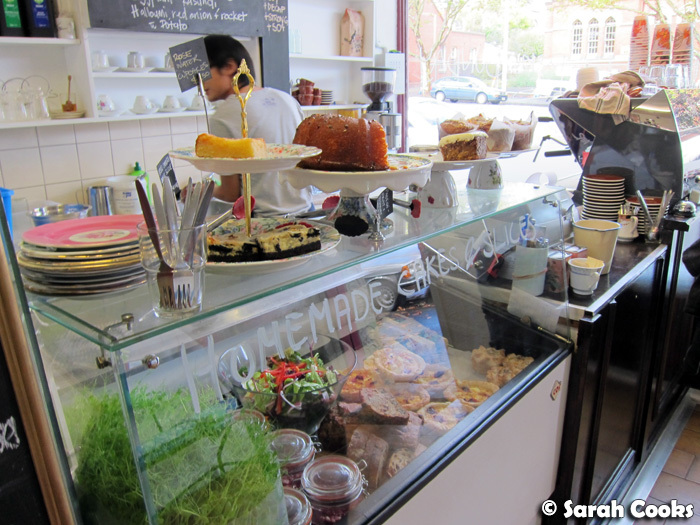 The items on offer were creative versions of Melbourne cafe standards: think things like mushroom bruschetta with goat's fetta, olive tapenade and candied proscuitto; a BLT with spicy avocado smash; and chilled rice pudding as a breakfast item. Happily, everything was well priced (the most expensive item was a steak sandwich at $19) and most of the meal-sized items hover around the $15 - $16 mark. I didn't sneak a taste of Wes' patties (har har), but by all accounts he greatly enjoyed them. I can't resist anything containing broad beans, and my lunch - the pea and broad bean mash with mint, ricotta and poached eggs - was deliciously fresh and vibrant. 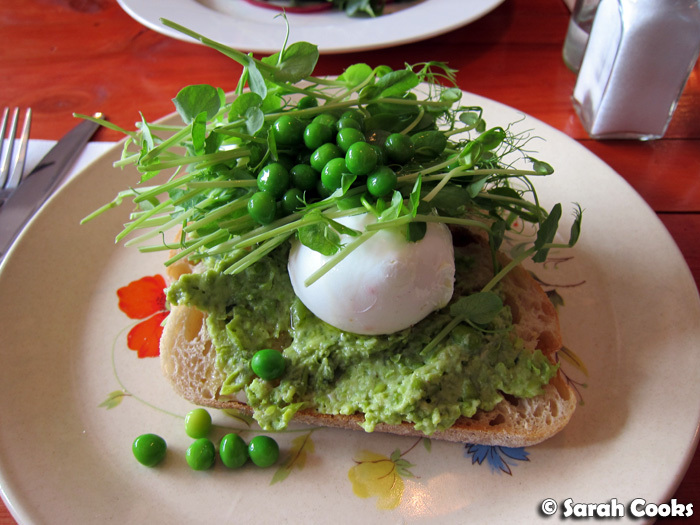 The rich, softly poached eggs were perked up by the super-sweet green peas and the minty mash. Gorgeous! 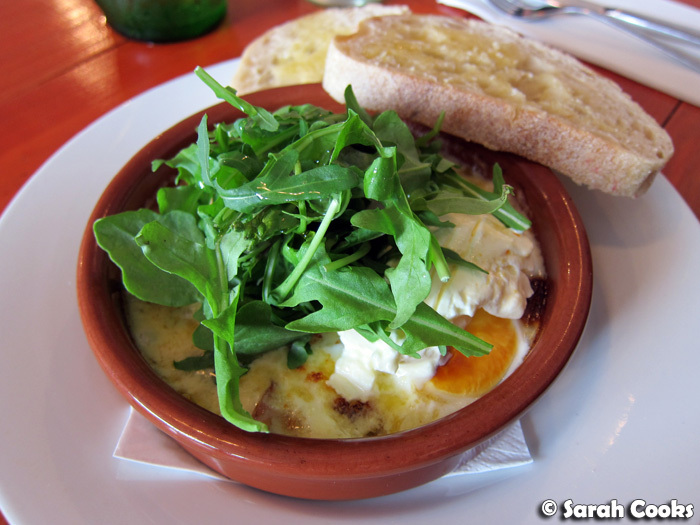 Equally fabulous, but on a totally different register to my meal, was Sandra's baked eggs with cheesy potatoes. Almost like a tartiflette but without the bacon, this was incredibly decadent: thick slices of potatoes baked with eggs in a cheesy sauce, topped with a generous dollop of sour cream (or crème fraîche?) and rocket. It sounds like it could be heavy, but it was totally amazing. They do a different version of baked eggs each day, but if they're doing the cheesy potatoes when you visit, I highly recommend you order them! Any cafe that makes their sweets in-house rather than buying them in gets a big tick in my book, and Elceed has a range of gratifyingly homestyle cakes on display. (We even saw a big square chocolate cake/slice thing cooling on a rack above the oven as we got up to settle the bill, so I think they keep baking throughout the day.) If we weren't in a rush to get Wes back to work on time, I'd have loved to linger over a slice of Oreo cheesecake or passionfruit and yoghurt bundt cake! Although I'm sad we missed out on Beatrix this time, I'm so glad we had the opportunity to discover Elceed - such a fab, low-key and delicious cafe!